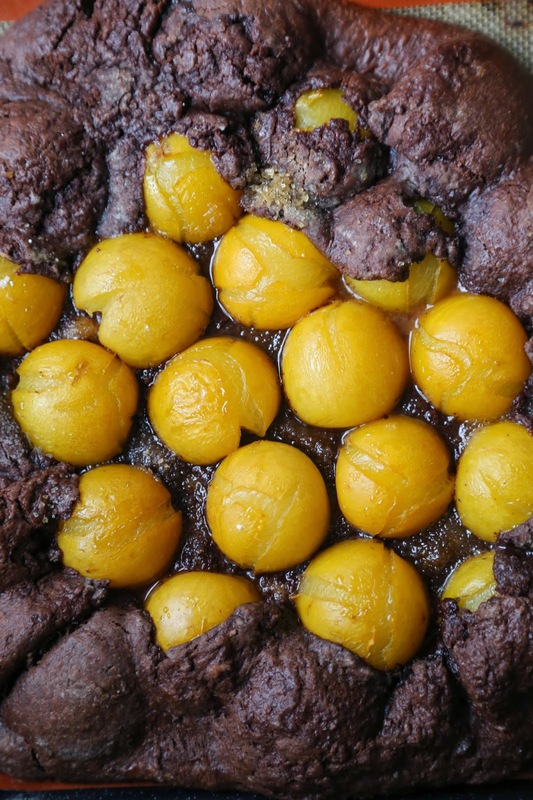 This pudding is so rich, it was one of the most popular dishes of my South African stone fruit supper club. 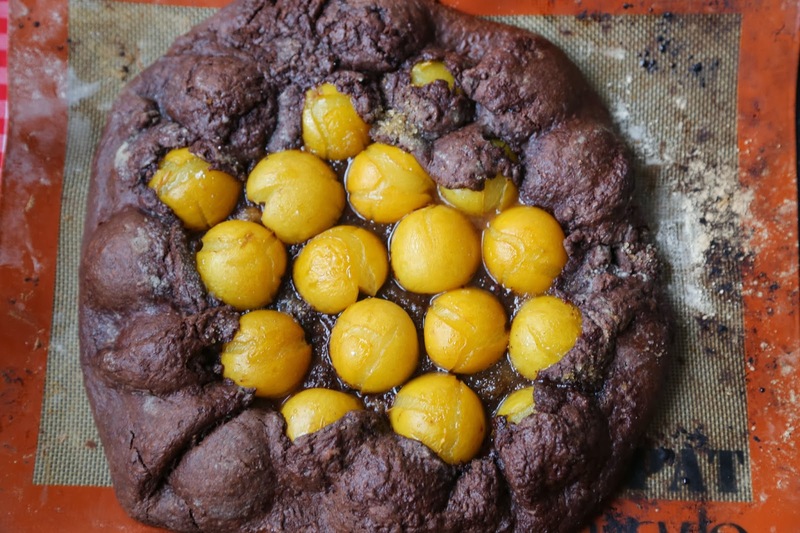 When I saw the vibrant buttercup yellow of the plums, I wanted to contrast it with earthy chocolate pastry. Inspired to make a galette, but not the galette des roi that the French traditionally have in January, I constructed this warming, succulent beauty, with pastry so rich and flaky that it’s almost brownie-like. I also used the Tonka bean which is often matched with chocolate or used in pastries and stews. It has a flavour and scent reminiscent of vanilla and cinnamon, although can be bitter tasting. In cooking, the Tonka bean endows the dish with an element of the unusual and depth. In some societies it is associated with magic, if you hold the bean, make a wish. Combine the flour, sugar, salt, cocoa powder in a bowl or a food processor Add the cold butter and cut it into your flour mixture, or pulse it briefly in the processor until it ressembles coarse meal. Then gradually add the cold water, stirring/pulsing the mixture as it pulls together. You want to handle the dough as little as possible so that it doesn’t warm up. Then form the dough into a thick disc, cover with cling film and leave to rest in the fridge for half an hour. Prepare the plums, I used the South African ‘Sunkiss’ plums, cut them along the dimple line at the top, then twist and separate. Remove the stone. Line a baking tray with a silicone mat or parchment paper. Remove the dough from the fridge, sprinkle flour, as if you were skimming stones across the water, along your clean countertop. I actually rolled this dessert directly onto a silicone mat, which avoids having to move it once again onto the baking tray. So I floured the silicone mat and also around the edges as the circle I rolled was bigger than the mat. Roll out a circle of approximately 35 cm diameter. 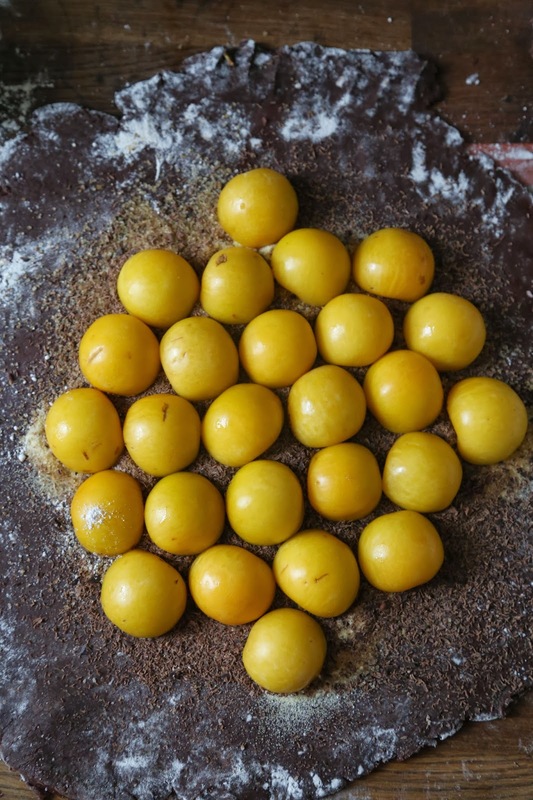 Then sprinkle the semolina into the middle where the plums will go. Grate the tonka bean, if using. 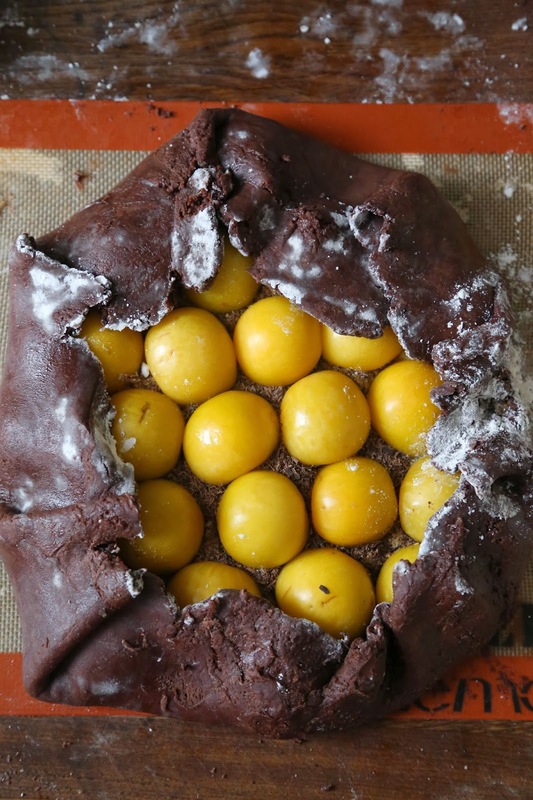 Then sprinkle the inside of the circle with demerara sugar and grated dark chocolate. Place the plums, cut side down, in the centre, making concentric circles. Leave a wide border of 5-7 cms around the rim. You will fold this border over, so that the fruit is contained. Lifting the silicone mat onto a baking tray, bake the galette for 15 to 20 minutes. Take a sheet of tinfoil larger than the galette and cut a circle out of the middle, about the size of the plums. After 20 minutes, slide the galette out of the oven on it’s shelf, then place the tin foil on top of the galette, so that the bumps on the galette pastry don’t burn but the plums still cook. Cook for another 20 minutes then either serve immediately, using two fish slices to transfer it onto a plate or leave to cool. It can be eaten hot or cold. However if you want to make it earlier in the day, then reheat it in the oven for another ten minutes. What a lovely, rustic dessert. I'm intrigued by the tonka bean, sounds like a wonderful addition! Thanks Lily. Try Tonka beans, see what you think? Oh my what a riot of colours! Its looks like the Hawthorn AFL Football Club dessert! I love it – I don't like Hawthorn but I love the look of this dessert. Tonka beans? are they related to Tonka toys? Don't be silly. I have not come across them before but I bet they add depth to this galette. I am making this one. haha. Yes the colours are brilliant. It did taste good didn't it?